The only inconvenience of yesterday’s very interesting meeting on the educational project on West-Flanders prison inmates ‘Walls become doors’ (in Dutch: Muren worden Deuren - link to website here) was its location: the cellars of the splendid castle of Tillegem in Bruges. Indeed, my iPhone mentioned ‘no service’ for most of the afternoon there. But as a Twitter addict, it is sometimes a good test to be cut of from the world, to listen with exclusive attention for those in front of you. So I took time and full attention to listen to the project presentation by Gunter Petry and Bea Van Imschoot and the remarks of Hon. Prosecutor J.M. Berkvens, Member of Parliament Elisabeth Meuleman, professors Maria De Bie (UGent), Kristel Beyens (VUBrussels), Liesbeth De Donder( VUBrussels, Jurgen Van Poecke (director prison Bruges), Guido Verschueren (the legendary ex-director of the prison of Leuven Centraal), Sonja Salaert, director of Spermalie, and so many interesting people. I will as soon as possible write about this very interesting project that marries hope for an inmate with security for society. Your open letter to the ENCJ and HCJ as published on your website has come to our attention. In the circumstances we have taken the decision to withdraw appendix F from the report. It would be most ungrateful for me not to welcome this message and of course I appreciate your gesture that also erased the 3 Irish examples (on a list of 10). Mentioning me in Appendix F was indeed utterly incomprehensible in the perspective of my writings. Regarding the Belgian HCJ, many of my opinions were written in French, which made it the more accessible for ENCJ. It was also very weird that my case was chosen for Belgium, as our country counts many talented investigative journalists who then deserved this doubtful prize. Of course, some questions remain. I gather the list in Appendix F (and its original mentioning in p. 41) is more easily erased than it was inserted and adopted in the ENCJ meeting in Rome on June 13 2014. We are all jurists, so we know the rules of the game. Decision making is a question of arguments, documents, but also a question of procedure. Questions might thus be raised about the quality of decision making process within the ENCJ – but it is might be not up to me to insist on that. Neither do I understand the argument that “it was never intended that (i) would be identified”. Apparently, there are not so many “retired judges in Belgium” sharing their expertise with the press. The one who does, was easily recognized by his friends and foes alike. And anyway, there is no discussion #justicewatcher was the subject of your negative comment. Pointing that – even anonymous – example, has a chilling effect on whistleblowers and opinionmakers. This is not acceptable. 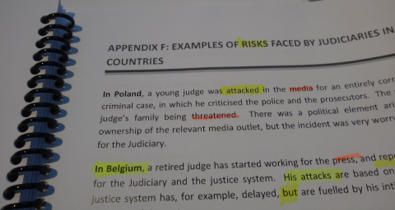 More than my case, the analysis of the 2014 ENCJ report is at stake, especially on page 40, where ENCJ considers the risks created “by pressure for the media” is the “most pressing and dangerous” and NOT those created by “the actions of populist politicians and Governments, failure of judges and the judicial system to attract the confidence of the public, by the internet, and by organized crime and corruption”. Moreover, the problem is the other way around. Not so much magistrates are under pressure, but the “free” press. May I refer –for Belgium - to the (civil) judgement in January 2013 of the tribunal of Mechelen (now in appeal) condemning top journalist and opinion chief of De Morgen, Yves Desmet on the demand of the wife (also a magistrate) of Antwerp procureur general Yves Liégeois. Or the complaints of –then – Antwerp court president, Jacques Mahieu against the filming (by the VRT Panorama crew) of judges during their visit of the Jain temple in the midst of ‘Diamondgate’. Last, I did not read any remark about the many legal en deontological problems in the Belgian HCJ I mentioned as a quote of my (French) opinions in my letter. Justice certainly is a question of principles. But also of practice. And on all levels of the Judiciary. Should the example not be given by the top ? Or is it easier to give orders from the top, than to be exemplary ? Justice is the work of human beings. We all can fail. We all fail sometimes. To admit this demands courage, and this courage is precisely what our citizens demand to regain faith in our Judiciary. In that regard, may i recommend you my actual Knack series about the death of Jonathan Jacob in Antwerp. Jan Nolf, Honorary Justice of the Peace. - the original version of the 2014 ENCJ report (100 pages) here . -the new version of the 2014 ENCJ report (98 pages) here.